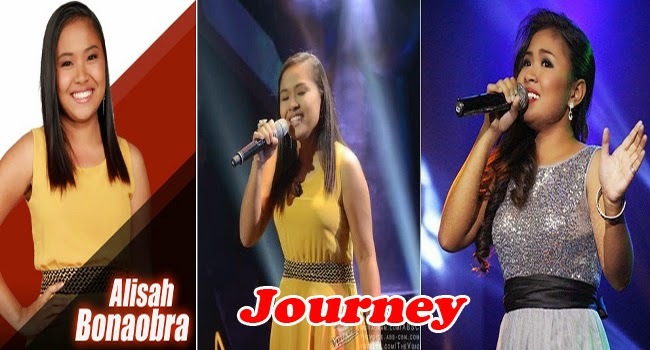 Alisah Bonaobra is about to step up the stage as one of the TOP 4 of the Voice of the Philippines Season 2. Will she be able to convince the public that she’s worth the grand title? Alisah and her family is a story of hardship, simplicity and dreams. They had to sell as street vendors to survive everyday and heve enough to get by. Even though she had a scholarship in her collage taking up Bachelor in Music Major in Voice, Alisah had to work and join singing contests to help her family’s financial needs. Alisah Bonaobra first became famous in a viral video which showed her singing ‘Let It Go’ in a Robinson’s mall Manila. In the end she had to give up her studies to concentrate on working. During her Blind Auditions, she was able to make Sarah, Lea and Apl to turn with her rendition of ‘Domino’. She had chosen Apl to be her coach as she believes that she could win the competition with him. During the KnockOut rounds, she was able to express her heart in the song ‘Follow Your Dreams’. She shared her dream to be the one to help her family rise from poverty. She also sung ‘Bituin na Walang Ningning’ as a song to tell her life’s story. She was determined to reach for her dreams no matter how hard at is. Her coach, Apl, had shared how Alisah had been getting better every week. He said that she has a way to tell stories with songs and make people feel how she sincerely feels. During the Live Shows, she shared that her mom had always told her not to be shy and not to give up. She said that selling in the sidewalk had been not easy and her mom had always been there. She was told that she has no right in the music industry but her mother inspired her not to let go of her dreams and keep on working hard for her goals. She had chosen ‘Let It Go’, which made both Sarah and Lea proud as they both know that the song was no easy piece yet she seemed to have delivered it effortlessly. During the Semi Finals, she sung ‘Lipad ng Pangarap’, which convey’s her dream to finish her studies. She believed that above all else, her studies is something she could not just let go despite stopping for a while. She had sung ‘One Sweet Day’ with Daryl Ong during the duets. In the end, she was able to get to the finals with the public votes and 55 points from Apl. Will she be able to get the title and live up her dreams? Find out by following us and be the first to know.